Week 10 challenges for the season 7 of Fortnite Battle Royale have been released, as well as its cheat sheet. Epic Games has released week 10 challenges for season 7 of "Fortnite Battle Royale" on Thursday, January 7. Even though these are last week's challenges, the current season will not end in seven days. This is due to the winter break the development team took in late December 2018. This gives players even more time to complete this season's Battle Pass and earn the unique rewards it contains. Week 10 is no different from any other week this season. There are seven different challenges which reward players with Battle Stars and Season XP. Three of these challenges are available to everyone, while all seven of them can only be accessed by Battle Pass owners. Completing four out of seven challenges rewards "Fortnite Battle Royale" players with 10,000 Season XP, while completing all of them unlocks a special banner. SquatingDog has once again released a weekly cheat sheet for "Fortnite Battle Royale" challenges. In this cheat sheet, you can easily see where you are supposed to go to complete week 10 tasks. The cheat sheet also includes the way of unlocking the third stage of the Prisoner outfit, as well as the secret banner players unlock after completing the entire set. The first free challenge in week 10 requires players to put down a Mounted Turret or a trap in three different matches. This is something that can be done easily in any mode, especially Team Rumble, and it requires little to no effort. 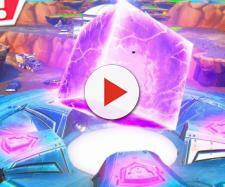 The second challenge will have players visit Lazy Lazy and Dusty Divot as its objective is to open seven chests at these two locations. Keep in mind that seven chests can be opened at any location and over the course of multiple matches. The final task is to get three assault rifle eliminations, and this is the task that rewards players with 10 Battle Stars. The first Battle Pass challenge is all about scoped weapons as players will have to deal 200 damage with them to complete it. The next task is probably the most annoying one this week as it takes five different matches to complete. Players will have to score five or more points at different shooting galleries in this multi-stage challenge. The last two tasks are relatively easy. One requires players to visit four different expedition outputs in a single match, which is something that can be done easily with an airplane. The requirement for the final challenge is hitting an enemy with a chiller grenade or a boogie bomb in three different matches.